If you opened up a Virgin America Elevate account prior to December 5th you can get 10,000 Alaska Airlines Mileage Plan miles for free. If you don't have a Mileage Plan account yet visit the link below in the bonus offers section to find the promotion and register for it (you also get an option of getting a $100 travel credit instead of 10,000 miles) If you do have an Alaska Airlines Mileage Plan account you can expect an email asking you to link your accounts and they'll give you 10,000 miles (no option of the $100 credit) I received the email this morning as I have not linked my accounts yet so they assumed I did not have a Mileage Plan account but the email does state if you do you can just click their link to be able to link your Mileage Plan and Elevate accounts. I gave it a few tries but kept getting errors. So I'll try later, maybe too many people are trying to link right now. Who knows. No matter what I am excited as those 10,000 miles are worth two short haul one way tickets and there is no cost to them. 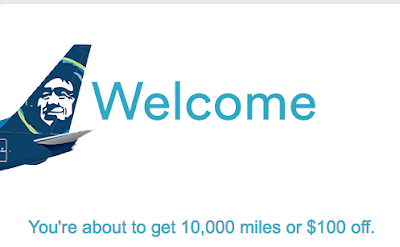 I will also transfer my Virgin America Elevate points over to Mileage Plan sometime soon as well. Those Elevate points were all free as well from the various free points offers they have had over the years. Got to love free stuff! Labels: Alaska Airlines Mileage Plan, Daily Update, Petro Points, Virgin America Elevate.